After the mess of House of M, Civil War, Alien Invasion, Siege, blah de blah, and the craptacular Fear Itself, the Avengers are a friggin’ corporation. You’ve got the Avengers, the Mighty Avengers, Secret Avengers, and formerly you had Dark Avengers. Geez. Well, the premier team, led by Captain America, who really needs to tell Obama to take some responsibility for national security himself and let Cap go and do his super hero thing, has brought back a beloved member of the past. The Vision! As you may remember, the Scarlet Witch in House of M went Bats**t crazy and nearly destroyed all mutants. She also had She-Hulk rip her husband in half. Revived, seeing the scary dingy world the so called Marvel Architects have created for him, the Vision has some new attitude…and a few things to say to Magneto and the Scarlet Witch. 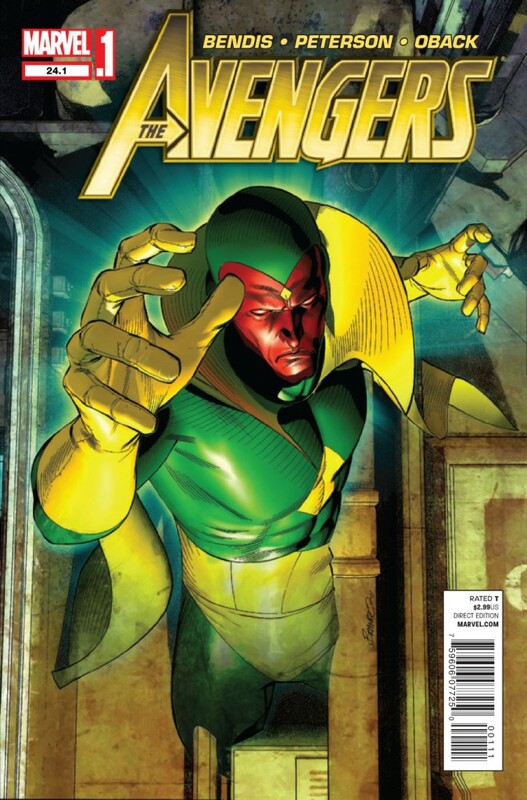 A nice lead up to the A vs. X summer debacle in waiting…..
Vision’s back! The Vision has been one of my favorite characters. As an aside, since I was about 10, I have enjoyed making custom action figures and statuettes. My very first was to create the Vision, from a Secret Wars Magneto figure. If I can get a picture to Boogeyman, it will be posted. It was basically just a straight paint job. But, it is one of the best representations of the Vision you will ever see. I loved his relationship with Scarlet Witch. I hated to see the Quesadas and morons at Marvel ruin one of the best couples in comics by making Wanda go mad and Vision be disassembled and reassembled so many times. It is good to see Vizh back and with a vengeance. Check out how he handles Magneto. The cover art is fantastic, and the writing is very good. The make up scene between She Hulk, who under Wanda’s influence tore Vizh to shreds, is humorous and poignant at the same time. Fantastic work. Vizh’s mixed feelings toward Wanda evoke the great storylines from the 1970s and 80s involving Vizh and his quest to be more human. OK, I get it. You want to push the Hawkeye and Spiderwoman romance. But, do we really need it all over the background of this story? Not so much. And, the way this story sets the stage but no one seems to remember Vizh doing what he did to Magneto in A vs. X 0 or 1. (see coming reviews). Marvel’s continuity is showing some signs of fraying. Maybe they need to quit squeezing every dollar out of a franchise by having six books with the same people. Just sayin’. Good story. Great return by Vizh. Wait til you see what he says when Wanda comes a callin’ in a future review.